In the legal battle between Usenet community FTD and Dutch anti-piracy group BREIN, some controversial allegations have been made. There are claims that not only did BREIN have as many as 15 undercover investigators working at FTD masquerading as regular users, but one of them - allegedly a direct BREIN employee - actually uploaded a 'pirate' movie to Usenet and posted its whereabouts on the site. In the Court of Haarlem last week, Dutch anti-piracy group BREIN began its face-off with the operators of Usenet community FTD in the hearing of their long-standing copyright dispute. According to BREIN, FTD is a service which allows users to illegally download movies, TV shows and music. Interestingly, the anti-piracy outfit also claimed in court proceedings that FTD facilitates uploading. This somewhat unusual accusation is made on the basis that ‘spots’ – reports made by FTD users which indicate where material may be found on Usenet – are made by people who also upload the material to Usenet and not innocent third parties that just happen to see material there. In their defense, FTD argues that they are a community for spotters, who under Dutch law may download legally and hence should be entitled to point out the location of material on Usenet. FTD insists that their users do not upload material to Usenet, but this assumption is now being tested since FTD didn’t count on ‘piracy’ being carried out by some special users in its community who were actually working for those they now face in court – BREIN. It appears that the Dutch anti-piracy group had as many as 15 undercover investigators operating inside FTD, working as any regular members might by ‘spotting’ media. BREIN’s Tim Kuik admits that these people were on the site but insists they were there to observe how the service operates. However, according to FTD lawyer Arnoud Engelfriet, things went a significant step further. “Some interesting items have come to light. Most notably, the anti-piracy outfit actually posted a movie on Usenet in order to ‘spot’ it on FTD so as to claim this kind of thing happens on FTD,” Engelfriet told TorrentFreak. The claims center around one particular ‘spy’ who went by the username of ‘NieZoekeNie’. FTD logged this user’s IP address and following checks it was traced back to an IP owned by BREIN. FTD say that the ‘NieZoekeNie’ account was operated by Mr Van Habraken, a BREIN employee. According to site records, NieZoekeNie ‘spotted’ a movie on Usenet – Laurel and Hardy’s ‘Big’ – and reported it on FTD. However, as can be seen from the screenshot below and an actual Usenet search, a user with the very same name also uploaded the movie to Usenet. 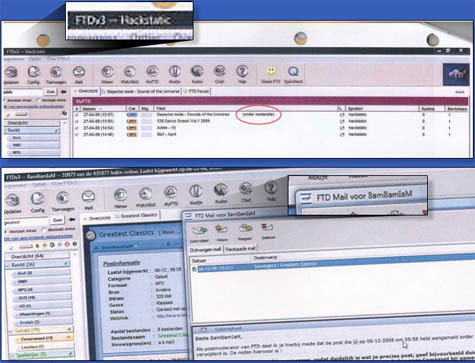 Staff also discovered that the same IP address used by NieZoekeNie was in use on three other user accounts on FTD – hackstatic, BamBamIam and Gab2009. The first two of this trio – hackstatic and BamBamIam – were confirmed in court as anti-piracy operatives when BREIN provided screenshots of FTD ‘in action’ but neglected to blank out the names of user accounts they used to gather the evidence. While it could be considered a coincidence that a username associated with a Usenet movie upload could be ‘spotted’ by a different individual that just happened to be utilizing the same name, it raises an interesting issue. BREIN earlier matched some FTD usernames with those used by some Usenet uploaders and has presented that information as ‘proof’ that they are the same people. That particular evidential knife seems to cut both ways, but BREIN boss Tim Kuik is having none of it. “No this is nonsense. FTD appears to be trying to draw attention away from its own dubious and illegal activity with irrelevant and spurious allegations,” he told TorrentFreak earlier this evening. A decision in the case is expected during November.